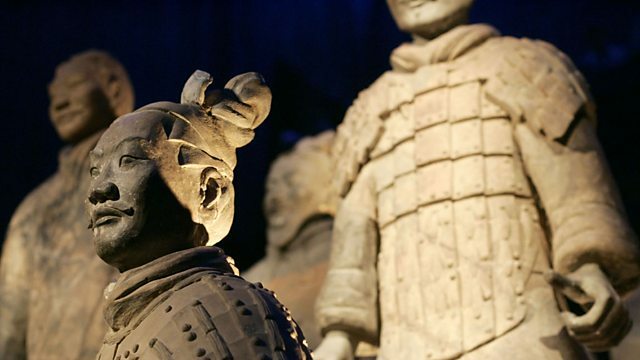 Melvyn Bragg discusses an epoch of astonishing productivity in Chinese history after Confucius and before the Terracotta Army that has great parallels with the golden age of Greek culture. Melvyn Bragg and guests discuss the astonishing productivity of the Chinese Golden Age. 400 BC to 200 AD is known as the Axial Age, when great civilisations in Asia and the Mediterranean forged the ideas that dominated the next two thousand years. In China the equivalent to the Golden Age in Greece was the Warring States Period. It was a time of political turmoil, economic change and intellectual ferment that laid the foundations for the first Chinese Empire. Astronomy was systematised, the principles of Yin and Yang were invented, Confucianism grew and Taoism emerged, as a hundred schools of thought are reputed to have vied for the patronage of rival kings.Why was a period of war such a fertile age for culture and thought, what kinds of ideas were developed and how do they still inform the thinking of nearly a fifth of the world’s population?With Dr Chris Cullen, Director of the Needham Research Institute at Cambridge University; Dr Vivienne Lo, Lecturer at the Wellcome Trust Centre for the History of Medicine; Carol Michaelson, Assistant Keeper of Chinese Art in the Department of Oriental Antiquities at the British Museum.